GUEST POST: If you’re a bariatric patient, you’ve probably heard the “NO NSAIDS” mantra. When you ask “why not?”, the general response is “they can cause ulcers” or something along those lines. Which is true… but do you know why that is? It’s not that I didn’t believe it, but I never understood why that would be. We just sort of take our doctor’s word for it in these things without giving it a second thought. And I never really did either until I was sitting in on one of the intro to WLS sessions at Unity Hospital (where I had my surgery) and heard Dr. Jeff Baker give a pretty good explanation to someone that asked about the medications they were on. After hearing what he said, I later asked him to give me a few more details so I could write about it here… cause I think it’s something that needs to be shared. I also want to thank Dr. Andrew Litchy, ND. He was one of my co-hosts from The Wake Up Call radio show, and he double-checked my facts for me here and gave me a few other points to make sure I shared. Ok, first off.. What’s an NSAID? It stands for Nonsteroidal anti-inflammatory drugs. NSAIDs cover a fairly broad group of such drugs, but the most well known would be ibuprofen, but aspirin also falls in to this category. Their two main uses are for fever reduction and inflammation/pain control. Taken safely, in the right dosage, they can be very effective for managing pain caused by inflammation. The prostaglandins are a group of lipid compounds that are derived enzymatically from fatty acids and have important functions in the animal body. Every prostaglandin contains 20 carbon atoms, including a 5-carbon ring. They are mediators and have a variety of strong physiological effects, such as regulating the contraction and relaxation of smooth muscle tissue. Prostaglandins are not endocrine hormones, but autocrine or paracrine, which are locally acting messenger molecules. They differ from hormones in that they are not produced at a discrete site but in many places throughout the human body. Also, their target cells are present in the immediate vicinity of the site of their secretion (of which there are many). Prostaglandins are natural chemicals which are involved in body inflammation. By inhibiting the body’s production of certain chemical messengers (prostaglandins), NSAIDs decrease inflammation. However, certain prostaglandins are also important in protecting the stomach lining from the corrosive effects of stomach acid as well as playing a role in maintaining the natural healthy condition of the stomach lining. Like I said, most of you are probably already aware that taking NSAIDs can lead to ulcers, but aren’t aware of the “why” behind it. It all comes down to these Prostaglandins (PGs). 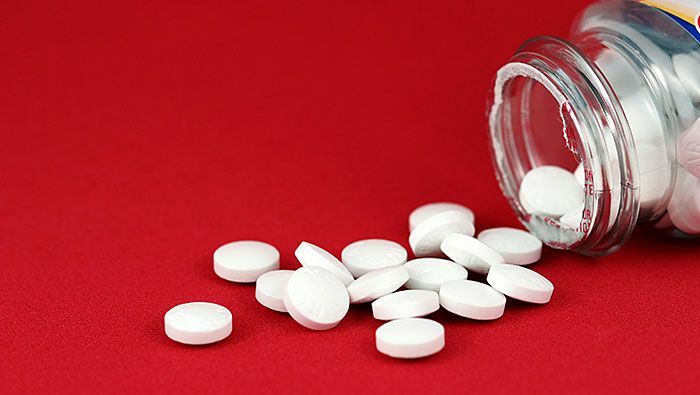 Taking an oral NSAID leaves one open to problems in a few ways. The NSAID blocks production of PGs (PE2 in particular when talking about the stomach)… leaving your stomach lining more vulnerable to it’s own acid, but then the medications themselves are already acidic in nature themselves, causing even more irritation to the stomach lining. There are some folks that feel this only applies to NSAIDs taken orally, and that using topical creams or receiving them via IV is ok – but that really only makes things slightly less of a problem because you’re only taking the direct contact to the stomach lining out of the picture. You’re still reducing the production of PGs, leaving your stomach open to attack from it’s own acid. Except in rare cases, the stomach can withstand exposure to highly concentrated hydrochloric acid, refluxed bile salts, alcohol, and foodstuffs with a wide range of temperatures and osmolarity. This is attributed to a number of physiological responses by the mucosal lining to potentially harmful luminal agents, and to an ability to rapidly repair damage when it does occur. Since the discovery in 1971 that prostaglandin synthesis could be blocked by aspirin and other nonsteroidal anti-inflammatory drugs (NSAIDs), there has been great interest in the contribution of prostaglandins to gastric mucosal defense. Prostaglandins modulate virtually every aspect of mucosal defense, and the importance of this contribution is evident by the increased susceptibility of the stomach to injury following ingestion of an NSAID. With chronic ingestion of these drugs, the development of ulcers in the stomach is a significant clinical concern. Now if all this is going on with someone that has a normal stomach, what about those of us with surgically altered ones? The possible problems is only increased. Please keep in mind here… I am not a doctor. At best, I played one for Halloween once. And while I did get input from some doctors in writing this, that was only to verify the jist of this content is medically correct. I’m not trying to give you any sort of medical advice, I’m just taking what I’ve learned in my limited research and trying to explain it in some simpler terms. Always check with your own doctor/surgeon before making any sort of decisions about any medications you take. Ok? Ok. That said, I’ll take a quick look at the different surgeries to try to break this down a bit. RNY Gastric Bypass: This one is sort of obvious when you think about it. These medications never hit your actual stomach, and while PGs are made all over the place, any NSAID you swallow is travelling through areas that typically wouldn’t be creating much in the way of PGs anyways, and then they block the production of them on top of it. Gastric Band: The NSAIDs hits your pouch first, then makes it’s way into the stomach. Even if it didn’t block production of PGs, gravity is working against you. Any of that protective layer being produced in the upper part of your stomach is constantly working it’s way down as well. But productions is blocked, so again, little to no protection. Vertical Sleeve: I couldn’t find much info on how much PGs are produced where, but given the greatly reduced size of the stomach with a sleeve (and I’ll include DS in here as well), even functioning normally, the protection has got to be fairly reduced. And once again, those NSAIDs are blocking that protection… still not a very good combination. Think of it this way… if you spend time in the kitchen, you’ve likely used a oven mitt or towel to pull a pan out of the oven at some point. Think of your hand as your stomach and the oven mitt as the PGs that are protecting you from the strong acids, or in this case the heat of that hot pan. Have you ever grabbed that hot pan with a towel or oven mitt that was wet? You feel the heat a LOT more than if that oven mitt was dry, right? That’s not the right way to protect yourself, not the way you’re supposed to use an oven mitt, right? You can do this a few times and you may be fine… but if you keep grabbing hot pans with a wet oven mitt, you’re just increasing your risk of eventually getting burnt. Does this mean if you take a single dose of an NSAID you will get an ulcer? Probably not. Under normal conditions it can take prolonged use before someone would develop an issue. But why risk it? When it comes to fever reduction and anti-inflammatory medications, there are alternatives. However, there may cases where the alternatives aren’t going to work for you. Maybe it’s allergies or other adverse reactions to the alternatives. Maybe your doctor has decided an NSAID is just plain going to be your best course of action. Does that mean you have to risk getting ulcers? No, there may be alternatives. There are NSAIDs out there that combine the active compound in the NSAID (usually diclofenac) with a synthetic prostaglandin called misoprasal. There are medications that combine the two into one prescription medication. Misoprasal can also be prescribed on it’s own, so there are options that may be worth asking your doctor about. PubMed: Prostaglandins, NSAIDs, and gastric mucosal protection: why doesn’t the stomach digest itself?